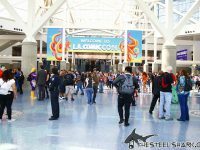 So it began, The first time I was at LA Comic Con for the first day before it started. Which was in the afternoon, and on a friday. I didn’t exactly cover a lot because there wasn’t exactly a massive crowd, but was still plenty enough to see happen. I would have stayed longer to see Tenacious D play, but that was the last thing happening for the day. Over all like every year it’s been a good con, and so far this was just the first day. Can’t want to see what the others look like.